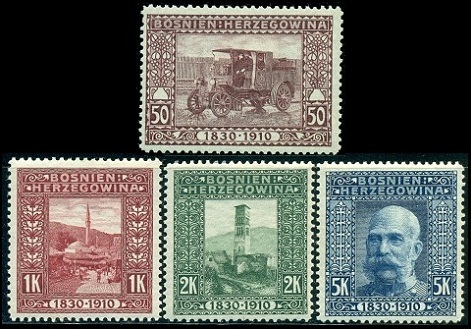 In 1906, Bosnia Herzegovina issued a brand new series of pictorial definitive postage stamps featuring national landmarks. This new series of stamps replaced the Coat of Arms definitive postage stamp designs that had been in use since 1879. 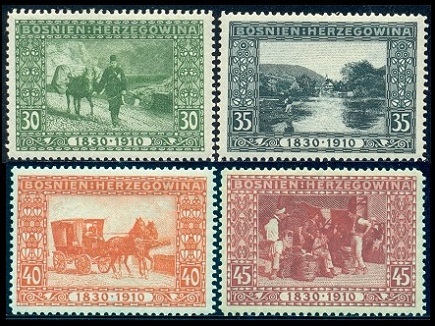 As with many of the Austrian Empire postage stamp issues of this time, there are many different production varieties of these new definitive stamps. Some of these varieties were actually intentionally created for presentation to government officials and influential stamp collectors of the time. They will be discussed in the section below. 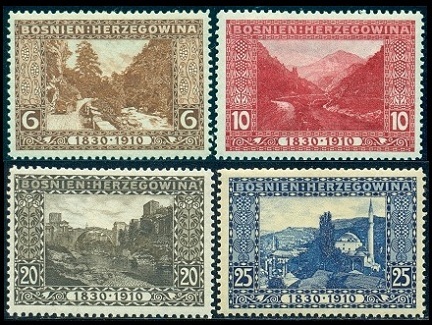 From the earliest days of stamp collecting, this series has been very popular with Worldwide collectors, as well as with those specializing in the postage stamps of the Austrian Empire or of the Balkan States. This single pictorial stamp issue could also be collected and studied as a life-long philatelic specialty. 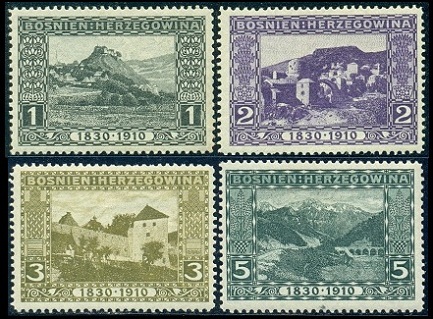 The sixteen major-type Bosnia Herzegovina pictorial definitive stamps shown above (Mi. #29-44, Sc. 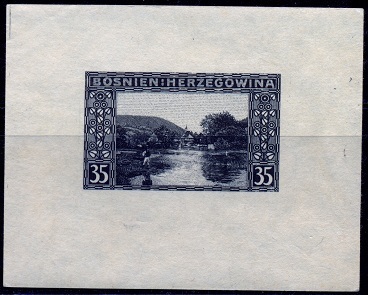 #30-45) were issued on November 1, 1906. Three examples of the many existing compound perforations are shown in the boxes above. Fortunately, for modern day collectors, most of these were intentionally produced in large quantities for government officials and philatelists, thus, they are fairly common today. The Michel Catalog lists lightly hinged examples at €20 each. The sixteen pictorial definitive postage stamps were produced in four primary perforation gauges, which are 6 1/2, 9 1/2, 10 1/2, and 12 1/2, with the perforated 10 1/2 and 6 1/2 gauges being the scarcest. 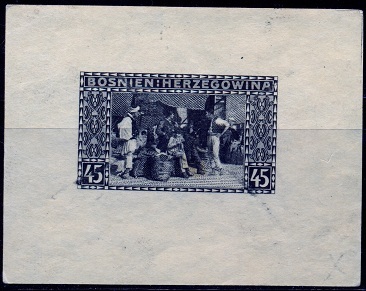 Scarce varieties of the 6 H. and 20 H. denominations exist perforated 13 1/2, and a scarce variety of the 45 H. denomination exists perforated 11 1/2. Trying to assemble a collection of all the denominations of this definitive series, with each of the known compound perforation combinations, would be a lifetime endeavor and would make an astounding looking philatelic exhibit. 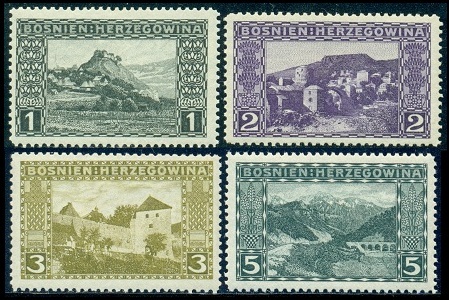 This Bosnia Herzegovina pictorial definitive stamp issue also exists imperforate. A hinged set is priced at €120 in the Michel Catalog. A number of different die and plate proofs and trial printings exist of all the denominations in this pictorial definitive stamp series. Shown above are three examples of what the Michel Catalog refers to as "individual items in black in miniature sheet format, imperforate on card, without gum". They look like die proofs to me. 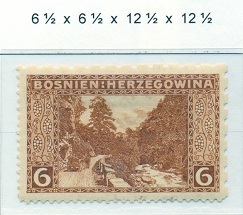 Miniature sheet format in the stamp colors, perforated, without gum. 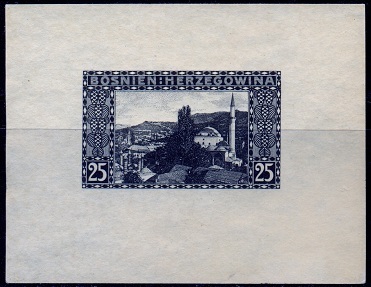 Miniature sheet format in black, perforated, without gum. 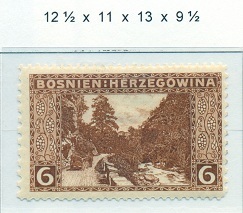 Miniature sheet format, imperforate on various papers, without gum. 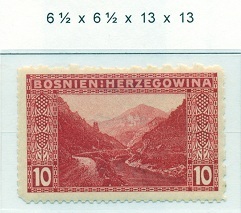 Miniature sheet format, imperforate on various papers, in trial colors without gum. Individual trial color proofs, imperforate, without gum. 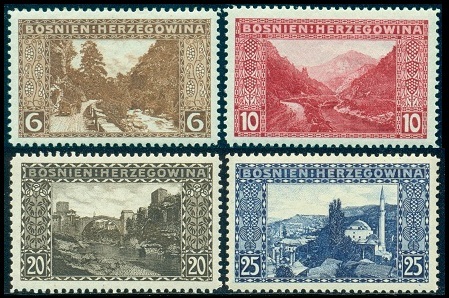 The sixteen major-type Bosnia Herzegovina pictorial commemorative stamps shown above (Mi. #45-60, Sc. #46-61) were issued on August 18, 1910 to celebrate the 80th Birthday of Kaiser Franz Josef I. 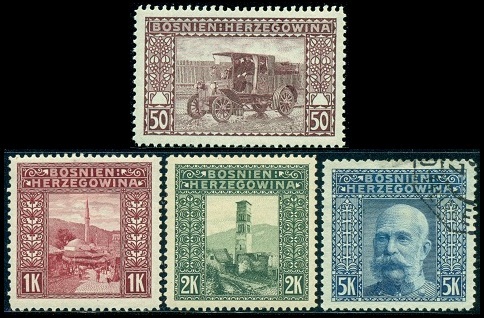 The designs of the 80th Birthday issues are identical to those of the 1906 pictorial definitive issues, except that the stamps are a bit taller, with a label containing 1830 and 1910 at the bottom of each stamp. 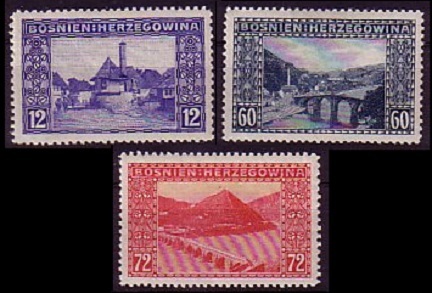 These new stamps, shown above, are all perforated 12 1/2. 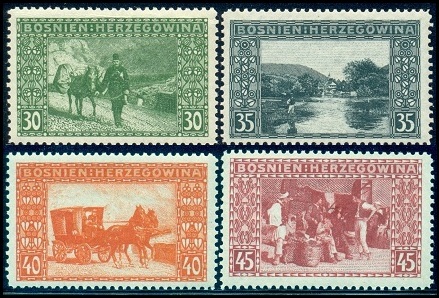 The three major-type Bosnia Herzegovina pictorial definitive stamps shown above (Mi. #61-63, Sc. #62-64) were issued on June 1, 1912. These new denominations were only produced using perforation gauge 12 1/2. These stamps also exist imperforate. The Michel Catalog lists the imperforate stamps at €150 for the set.